I was again invited by Openrice to try this new Japanese restaurant along Katipunan: Moshi Moshi. Moshi Moshi (which means "hello" in Japanese) opened last October, offers authentic yet affordable Japanese dishes. The color theme of the restaurant is lime green, with sleek furniture and ambient lighting, it's a nice hang-out place for either groups or couples. - This book was given to me as a Christmas gift (Thanks Jay!). A satirical novel from an anonymous author with the pseudonym Bob Ong. The book is in a script format and divided into three stories: an action movie, a love story and a horror story. The stories are humorous take on Filipino cinema during the 80s and the 90s. It gives a nudge on Filipino entertainment's lack of the originality in the past. The book will bring back your childhood memories (if you used to watch Filipino movies) and will keep you laughing from start to end. Much as I dislike it, I have to look for a restaurant within my friend's budget limit. I'm a bit lenient when it comes to food budget, that's why "budget eating" isn't one of my specialties (will work on it, I promise!). Then suddenly, Eat and Go comes to mind. Eat and Go is one of the many restaurants at The Atrium at SM Megamall, I would always remember seeing their promos but haven't tried it. One of the staff offered their Executive Meal for Two deal for Php 399, which we tried. The place looks like your cozy cafeteria. We opted to sit somewhere near the wall where delicious food photos where displayed, much to my hungry tummy's annoyance. With Executive Meal for Two, you may choose two entrees originally worth Php 195 each, one salad and two bottomless iced tea or lemonade. Cool, creamy, and bursting with excitement-- it’s no wonder why most people are so caught up with the milk tea craze. But how about trying something from the makers of the biggest froyo chain in the country? Now, that’s something new for sure. Who wouldn’t love cooling down with a semi-sweet, flavorful combo of milk and tea while dabbling some chewy and plump tapioca? After all, this one offers a different kind of beverage wonder to a thirsty and adventurous soul. 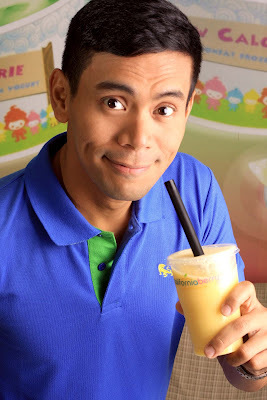 At Californiaberry, we make the excitement even more deliciously memorable in every cup of Boba milk tea!. Recently turned into a Japanese food fanatic, I've taken photos of sushi. Some pictures I have already shared previously, but I hope you wouldn't mind if I shared them again. More Japanese food adventures soon! Enjoy! There are few things that make my day: coffee, cheesecake or a breakfast meal. Since my friends are too tired to go somewhere else (and somebody's in a no-rice diet.haha) so we tried Caffe Firenzo. Caffe Firenzo is a quaint coffee shop that originated in Davao and began opening its branches in Metro Manila. They offer Lavazza, an Italian coffee brand. This location is already closed. After our dinner at Yabu , my friends started dragging me to Happy Lemon. I only agreed to try it as long as it's not milk tea. (And because it's my friend's treat.haha). Happy Lemon originated in Hong Kong and Chris Tiu (with his business partners) brought the franchise here in the Philippines. The place reminds me of a playroom with colorful designs and cute characters on the walls. The menu is displayed on the screens, but the display changes every few minutes that I just grabbed a brochure at the counter instead. My college friends and I took advantage of Xin Tian Di's Deal Grocer voucher offer and had a little get-together one weekend. Xin Tian Di is Crowne Plaza Galleria's Chinese restaurant which offers unlimited dimsum buffet. We got the deal for Php 780 per person (the original price is Php 1188), not bad for a hotel buffet. Xin Tian Di has a pocket view of the Ortigas business district with ambient lighting. We were seated at a round table, which was a bit awkward since there are only four of us. We didn't bother to ask for a transfer because we had a nice view of the place. Note: Both establishments are already closed. I was walking around the food court to look for lunch and I saw these two new stalls: Cowsing and Kroketten. Cowsing offers simple Taiwanese snacks like Crispy Chicken Chops, Chicken Skin, and Egg Crepes. Kroketten (German word for "croquette") offers potato croquettes will three different fillings: beef, pork and cheese. I've been reading and hearing a lot of good things about Yabu, a Japanese Katsu restaurant. Being a newly-converted Japanese food fanatic, I dragged my friends here for dinner. Yabu: The House of Katsu is the first and only authentic Katsuretsu (Japanese for "cutlet") restaurant in the country. Guided by the head chef of popular Katsu restaurant in Tokyo, Yabu assures each katsu is perfectly and deliciously-made. I salute Jollibee for making a huge effort in developing their menu and introducing a new item once in a while. As always a curious cat, I would always try whatever's new in Jollibee's menu. So I recently tried Jollibee's newest pasta item, the Chicken and Mushroom Pasta. It's available ala carte (Php 55), with drinks (Php 70) or with 1 piece Chickenjoy and drinks (Php 122). I've recently read several posts about Hainanese Chicken from my fellow food bloggers, so I decided to visit the nearest Singaporean restaurant from the office: Nasi Lemak. Nasi Lemak specializes in authentic Singaporean dishes and also serves Chinese, Thai, Malay, Indian, Indonesian and Japanese dishes. The restaurant looks classy with images depicting the streets of Singapore are posted on walls. Nasi Lemak literally means 'fatty rice' in Malay, whereby the rice is cooked in coconut cream. (Thanks to my friend from Malaysia who gave me a little lecture when he learned that I went to this resto). Each table has a buzzer to call the staff's attention if you're ready to order or if you need anything else. It's quite a convenience that I think other restaurants should install buzzers too. A colleague discovered this in a tiangge so when another colleague ordered for a small celebration, I ordered a small box to bring home. Puto Pao is a white bun with asado or pork fillings. We used to make Puto Pao at home, sometimes using tuna instead of pork. Since we don't have time to make our own, this is a good alternative. Yoshinoya was named after the founder's hometown, Yoshino in Osaka Prefecture, Japan. It is an international Japanese fast food chain serving specializing in gyudon or beef bowls. Note: This restaurant has been rebranded to Kappu Yakiniku. As I've always mentioned in my previous blog posts, I'm not a fan of Japanese food. I'm not sure whether I just went to a not-so-good Japanese restaurant or I was just traumatized by a bad-tasting california maki a few years ago. But I'm a foodie, I got to try everything, so I went to Asian Bites to try some Japanese food. Asian Bites is a restaurant under Robinson's Supermarket serving mainly Japanese food. It's an open area located in front of the supermarket so expect lots of people passing by. Most people eating there are usually people who had quick runs at the grocery during lunch time. I did a review for Army Navy during my first month as a blogger, and I thought that a second review would be appropriate to this resto that never fails to make me satisfied that I could barely stand up because I was too full. This is how good--and affordable Army Navy is. Army Navy is a military-inspired restaurant that offers affordable American and Mexican specialties. There are some people who think Mexican food is pricey, but you might be surprised on how affordable Mexican food is in Army Navy. Everything is so good that even the iced tea is a must-try. February is the month where I fell in love..with cheesecake. For unknown reasons, I've been craving for cheesecake like an alcoholic craving for beer. But it occurred to me that I've never tried the cheesecake from Starbucks as I would always order waffles, cinnamon roll, donut or banoffee pie with my coffee.